OKC.NET | On Dasher, On Dancer, On Prancer, On Vegans! On Dasher, On Dancer, On Prancer, On Vegans! Vegan Holiday Treats for Good Little Boys and Girls! For most kids, Christmas is about gifts and Santa. But once you become an adult, Christmas seems to be all about baked goods, holiday cookie exchanges and sugar-laden office parties. As a vegan in Oklahoma, I usually miss out on the sweetened fun. I’ve never received an invite to a cookie exchange that wasn’t followed by the sentence “Oh wait, never mind, nothing will be vegan,” and at my office party, I politely nibble on the fruit plate, while my coworkers eat themselves into a pre-diabetic coma. But, there’s no need for vegans to feel left out this holiday season! With the recipes below, anyone can give yummy vegan treats that will bring on the holiday spirit! Because I loathe shopping, every year I make up several batches of these to give to relatives as Christmas gifts. My relatives swear that they never last longer than Christmas Day since they are addictively delicious. I started making them because I wanted to send my far-away relatives a little taste of Oklahoma, but the only other Oklahoma foods I could think of were peaches (out of season) and beef. Since this vegan isn’t sending beef anywhere, pecans it is! If you aren’t vegan, I’ve heard that butter makes them just as tasty. Preheat over to 350°F and grease a cookie sheet, ideally one with sides. Combine the spices and salt in a small bowl. In a medium saucepan combine the margarine, sugar and water. Stir over medium heat until the sugar is fully dissolved and the mixture starts to boil. Add the spices and pecans and stir to coat. Continue cooking and stirring for five minutes. Remove from heat and pour the nuts onto the cookie sheet, spreading them out so that they are almost in a single layer. Bake for 10 minutes, then remove from the oven and let the nuts cool in the pan. 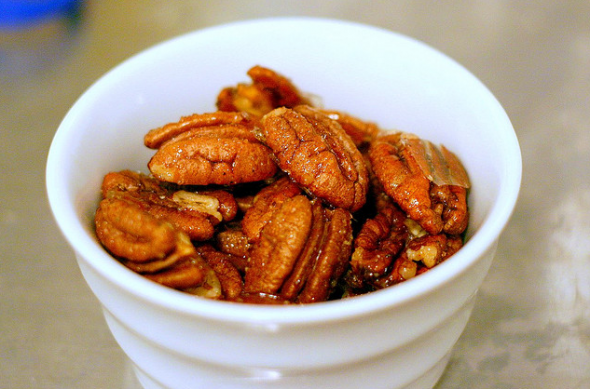 Remove the pecans with a metal spatula and store in an airtight container. These keep well in the freezer and are easy to ship. This is the perfect treat for lazy bakers! What could be easier than a four-ingredient candy that does not require baking, candy thermometers, or figuring out whether it’s at the “soft ball,” “hard ball” or “soft crack” stage. Just stay away from the hard crack stuff. That can really burn you. Also, I’m all for natural peanut butter, but to get the right fudgy consistency, it’s best to use the processed stuff. The chocolate layer is totally optional, but totally wonderful. Melt the margarine in a large bowl in the microwave. Stir in peanut butter until smooth. Stir in the powdered sugar a little at a time, until a thick dough is formed. If the powdered sugar is very lumpy, a sifter will help to prevent sugar lumps. Spoon the fudge into a margarined 9×9 inch square pan and pat smooth. Melt the chocolate chips in a double boiler over simmering water, or in a bowl in microwave. Spread the chocolate over the fudge and let it solidify, but not totally harden. 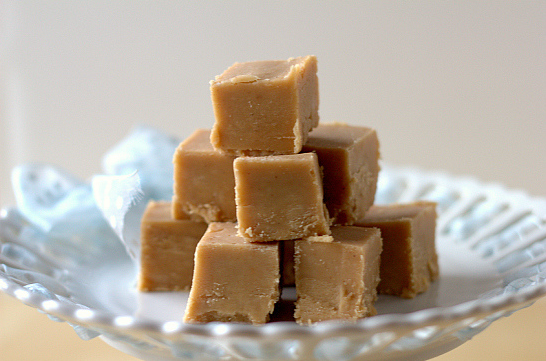 Using a sharp knife, cut the fudge into squares. Package into cute boxes or bags to give to friends and coworkers. Gingerbread men are a perennial Christmas favorite. 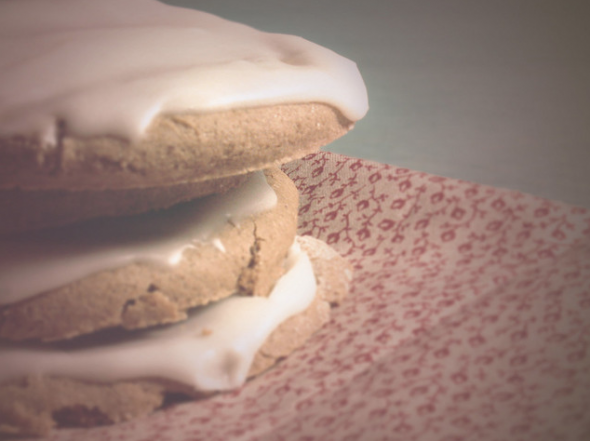 This recipe can be used to make Gingerbread men, women, menorahs, winter solstice suns, Kwanzaa cups, or just about whatever cookie cutter shape is lying around. I warn you, this recipe does not lend itself to being all healthy-vegan, so do not use blackstrap molasses. Though there is more iron and calcium in the blackstrap variety than regular molasses – and what vegan doesn’t need more calcium and iron in her diet! – it doesn’t have a high enough sugar content. Your cookies will taste weird and your friends won’t eat them. Even out of pity. Preheat oven to 375°F and grease a cookie sheet or two. Sift together the flour, salt, baking soda, baking powder, ginger and cloves into a medium bowl. In a large bowl, cream together the margarine and sugar. In a small bowl or mixing cup, stir together the molasses and water. Add about half of the dry ingredients to the butter mixture and combine. Add about half of the molasses mixture to the dough and stir well. Add the remaining dry ingredients and molasses mixture, stirring well after each addition until the dough is well combined. Pat the dough into a ball, cover in plastic wrap and refrigerate for one and half hours. Roll out the dough on a lightly-floured surface until it is ¼ inch thick. Use cookie cutters to cut out desired shapes and place onto cookie sheets. Bake for 10 minutes. They should be slightly puffed and look solid. Cool on a rack and decorate with friends. Tagged Christmas Candied Pecans, Christmas Day, cookies, cs, Earth Balance, heat, Molasses Gingerbread Cookies, Peanut Butter Fudge, weird. Bookmark the permalink.